So you want to give dance as a gift? You have come to the right place: Lake Shore Dance Academy. We are the up-and-coming dance academy in Illinois’ North Shore community. Here at Lake Shore Dance Academy, we strive to support our students and dancing community to live happier and healthier lives. 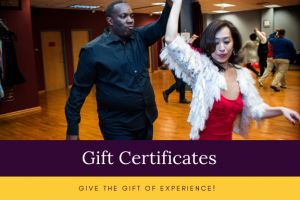 Our gift certificates are a great way to introduce that special someone in your life to the world of Ballroom and Latin dancing. They are great for Holidays, Birthdays, Mother’s or Father’s Day, Valentine’s day, Anniversaries, or just because! Gift cards can be purchased electronically below. If you prefer we can send a hard copy gift card either to you or the recipient, please let us know by calling the studio. You will find that on our gift certificates, we include our phone number and email address. Find our gift certificate options below or check out our Gift Certificate FAQ for more details. Still considering to invest in a friend’s, family, or loved one’s life? Here are our Gift Certificate FAQs. Think about the possible gifts you could receive or gift to someone: that new TV, video game systems, clothes, and/or jewelry. Granted all of these gifts would be pleasantly received, but the interesting thing about these gifts is that with time these items may lose their luster. Fortunately, there is a remedy to this apathetic reality: new experiences! Research has shown that people enjoy looking back at their fond memories, yet they are always yearning for the “next new thing”. You will learn that ballroom dance provides learners with a new experience at each and every lesson! Thus buying dance lessons would bring a sense of novelty and genuine enjoyment in your friend, family, loved ones, and/or your life! Yes! By gifting dance lessons, the newly wedded couple can avoided the dread stand and sway dance and really make their night memorable with an impressive first dance! In fact, by gifting the newly engaged couple with dance lessons, you can help ignite a life-long hobby that will enrich the couple’s lives for years to come. 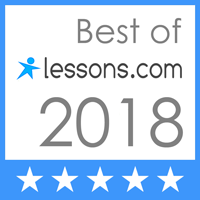 Our recommendation, though, would be to gift the couple with ballroom dance lessons sooner rather than later, so the couple has a reasonable amount of time to learn and prepare for their first dance. Click here to learn more about our wedding dance lessons FAQ or to watch some of our First Dance Videos.